The Black Balloon, a movie opening today in New York City and Los Angeles, is about an Australian family who has a severly autistic son, Charlie, and must find ways to cope with his emotions and antics. Calling the movie “harrowing,” New York Times movie critic Stephen Holden asks: “Would you be able to cope? … Would you find in yourself the seemingly infinite reserves of love and patience possessed by the Mollisons, the movie’s itinerant, highly stressed army family who have just moved to the suburbs of Sydney? 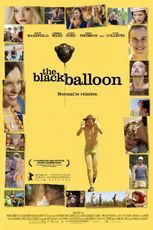 Maybe not.” The Black Balloon stars Luke Ford as Charlie, the autistic teenager; Rhys Wakefield as his brother Tommy, and the Oscar-nominated Toni Collette as their mother. With a tag line “Normal is Relative,” The Black Balloon is a story about fitting in, discovering love and accepting your family, no matter the price.